In my initial impressions and the first part of this review, I outlined why Assassin’s Creed Origins is a great title. 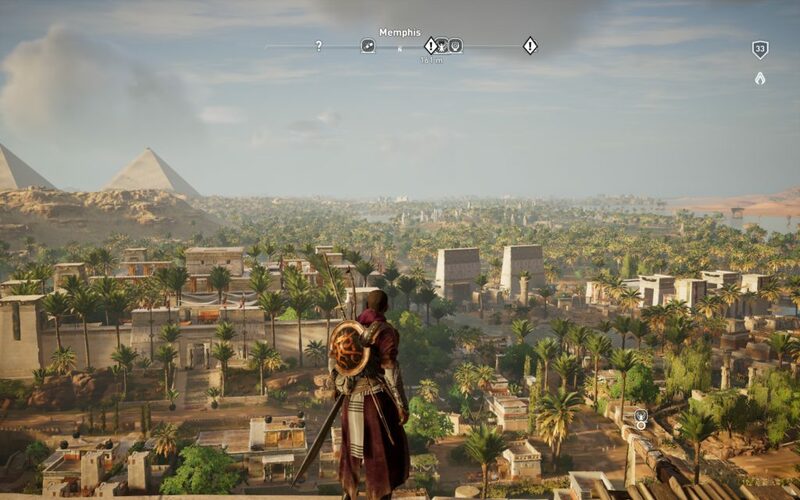 With gameplay that’s smoother than the silt of the Nile Delta and an open world that makes great strides towards completely re-balancing the equation of the established Ubisoft formula, it has so far proved itself to be a game for the ages. At the very least it’s a firm contender for my personal game of the year. However, spectacular visuals and compelling gameplay are not enough to carry a release of this caliber for its entire length. Story is a crucial element of games of this type and that’s what this part of the review is going to focus on. Ubisoft’s flagship series has always been known for its intricate and complicated lore involving an international conspiracy and proxy war waged between two secret organisations: the Templars, who seek to control mankind with ancient technology left behind by a long extinct precursor civilization, and the Assassin Brotherhood who seek to defend the world from the consequences of abusing powers that are presently beyond mankind’s comprehension. 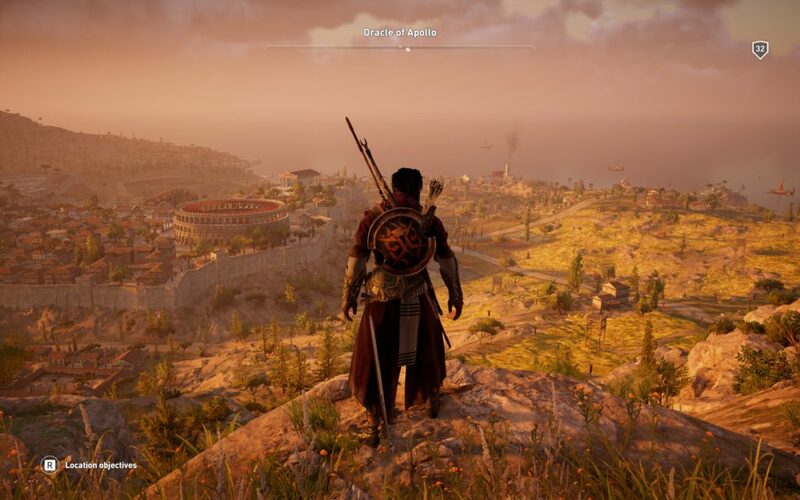 The games have generally been structured so that players experience short sequences of the title specific story interspersed with modern-day segments that tie each release into the Assassin’s Creed meta-narrative. It’s a structure that worked for the last nine main series entries but just as with the refined combat mechanics, overhauled traversal system, and enhanced world building, Ubisoft Montreal opted to take a slightly different approach to narrative design with Origins. The two primary story arcs of the historical setting and the modern day are still juxtaposed against each other as in previous games, but keenly aware that the latter setting isn’t the main draw of this series, the developers make use of it sparingly. 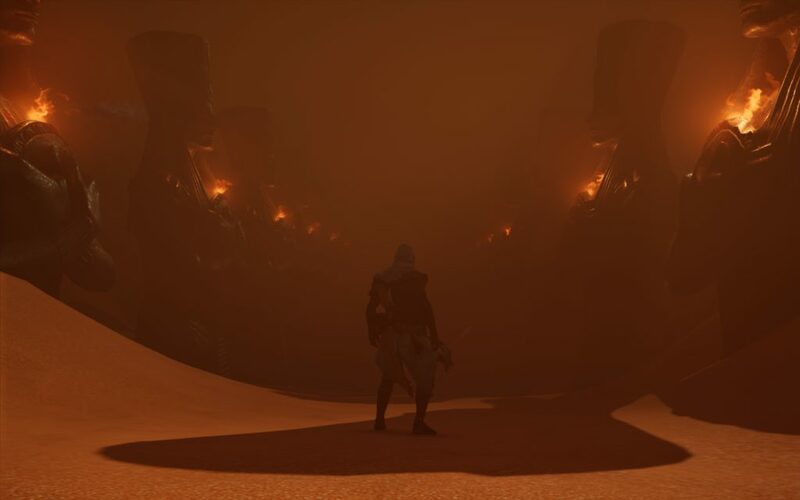 The contemporary setting is utilized as a framing device for Bayek’s story and to create an air of mystery that feels more fitting for the series than the action thriller set pieces that characterized these sections in prior installments. No doubt they certainly added a variation of pace but they were mandatory and often proved to be a jarring intrusion into the historical storylines. What takes their place is an unobtrusive and pared back modern day component that hints at the conspiracy at the core of the entire narrative instead of bombarding players with waves of superfluous exposition. Layla Hassan, ably voiced by Chantel Riley, is the central character of these segments and even though we only see her a handful of times over the course of the game and know very little about who she is or what she is doing, beyond being an employee of Abstergo with an intense interest in the Animus project, she nevertheless has a strong presence. The main reason she’s so intriguing is precisely that she’s mostly a mystery. Players will naturally wonder and speculate about her which leads them to directly engage with the grander story even after they’ve finished the game. But Layla isn’t just notable because she’s the vanguard of the new direction that Ubisoft are steering Assassin’s Creed in. It’s clear to everyone that modern games have a significant representation imbalance when it comes to the gender, chosen or otherwise, of their protagonists. When Unity was released Ubisoft found themselves under fire for their questionable justifications for the game not featuring any playable female characters. The inclusion of Evie Frye as an additional main character in Syndicate was largely done to address such criticisms but obviously, it didn’t quite go far enough. 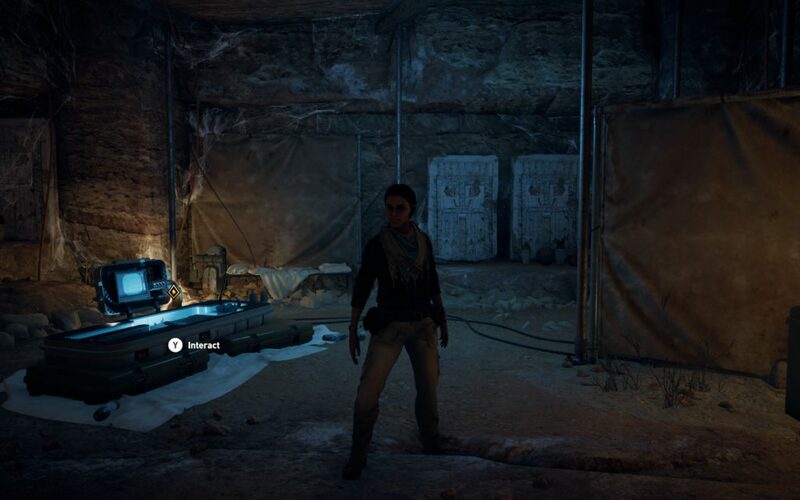 Granted the focal point of the story in Origins is most assuredly Bayek, but by electing to use a female lead for the modern day material Ubisoft have clearly stated their intent to re-frame the driving meta-narrative of the franchise. Given the company’s history, I was pleasantly surprised to discover that Layla was to be the new face of the series’ modern-day aspects. It sounds strange that even though it’s the current year the industry still has issues with creating truly representative rosters of new gaming icons. I wasn’t so much surprised at the character but more that the company had the courage to make that choice. As a stockholder favorite the Assassin’s Creed franchise is an easy target for the homogenization that results from design by focus group, which is so pernicious in its impact across the entire games industry that even Bioshock Infinite fell prey to it. That Ubisoft would allow its developers to buck the supposed easy-money trend and push such a delicate envelope at this time shows a growing sensitivity to the current social climate regarding gender representation in the media at large. Hopefully, we’re moving ever closer to the day when developers can present stories told from an even broader range of perspectives and where the lead of most games isn’t some minor variation on the theme of a miscellaneous alpha male dudebro. Ubisoft also took note of the criticisms concerning the protagonists of the historical storylines. The series has bounced between central characters ever since the departure of Ezio, the Florentine aristocrat with a penchant for bounding between rooftops like a 16th century Batman, who fans came to love as the star of Assassin’s Creed 2, Brotherhood, and Revelations. While it’s true that each successive character was distinctly different with their own individual reasons for either joining or betraying the Assassins, none of them ever really had the same presence as Ezio. The re-invigoration of the series continues with the choice of Bayek, the last of Egypt’s Medjay and forerunner of the Assassins, as the central character. Thanks to a remarkable performance by voice actor Abubakar Salim, Bayek has the charisma and strength of character to really make players care about the events that unfold around him. The over-arching story details the beginning of the Hidden Ones, a prior incarnation of the Assassin Brotherhood, and the start of their crusade against the Order of the Ancients, the shadowy cabal that acts as a direct predecessor of the Templars. Although that nascent conflict gives the story a larger context, in truth it’s really a good old-fashioned tale of revenge. In a brutal twist of fate, Bayek is forced to kill his own son, a tragedy that leaves him understandably broken and wrathful. Abandoning his former life he sets out to claim bloody retribution for his loss. Now, this does just follow the staple trope of a hero avenging the death of a loved one, which seems to be the go-to choice for Ubisoft writing teams these days, but whilst it was somewhat predictable I nevertheless found myself rapidly caught up in Bayek’s struggle for justice. The game takes us through a series of assassinations as Bayek begins to hunt down those responsible for robbing him of his family and his place in Egyptian society. It’s only once he encounters Aya, his estranged wife, and becomes embroiled in the political machinations of Cleopatra and her, encourage that he realizes that there is a much more sinister scheme in play than he first thought. Bayek learns that those responsible for the death of his son are corrupting and tormenting all of Egypt to serve their own nefarious ends. Together the reunited spouses and their royal patron embark on a quest to unmask and eliminate all remaining members of the Order of the Ancients, to finally avenge their son and to liberate their country from the mysterious cadre of would-be tyrants. From the depths of the desert and the tombs beneath the Giza Plateau all the way to the senate halls of Rome itself, Bayek and Aya travel to some of the most important places in the known ancient world as one by one they catch up with their targets and end their wretched lives. A plot structure dependent on assassination sequences is nothing new for the series, but this is one area where it wasn’t really required to make any drastic changes. The step-by-step approach to assassination as seen in the Hitman series, is part and parcel of the game’s core concept but it could have been made more explicit in this outing. As it stands much of the groundwork for the assassinations and understanding who the targets are is provided in the side quests, so if you want the full experience I’d suggest doing any optional missions in an area before you proceed with the main quests. Although the story isn’t as transformative for the series as so many other elements of Assassin’s Creed Origins, it is an approachable tale, well and boldly told, that sets a solid foundation for the franchise going forward. That’s something that hasn’t been true of the series for many years and it will be intriguing to see just how dedicated to this new paradigm the company really is. The reveal of Amunet at a certain point in the game also gives me hope that Ubisoft are using her tangential presence in Origins to pave the way for a transition into a sub-set of Assassin’s Creed titles with a dedicated female protagonist. As Tomb Raider has always proven and Hellblade: Senua’s Sacrifice recently reaffirmed, female protagonists have no detrimental effect on a game and it’s absurd that such an irrational perspective has been an accepted part of corporate mentality for decades. For that and all the reasons, I’ve previously discussed Assassin’s Creed Origins isn’t just a fantastic game in its own right but serves as a barometer for where the industry currently is and where it’s heading. Unfortunately, before I offer my final thoughts on the game it’s probably best to deal with the bloated, festering elephant corpse in the corner of the room: loot boxes. Shortly before launch, it was revealed that this game would contain loot boxes but don’t panic it’s not as bad as it sounds. As we’ve seen with the recent backlash against random loot boxes in Shadow of War and Star Wars: Battlefront 2 these kinds of premium cash shop elements in a full-priced AAA game do nothing but foster resentment on the part of the player base because it’s seen as double-dipping for the sake of pure profit. Beyond that their presence usually trivializes entire progression systems and makes games pay-to-win. 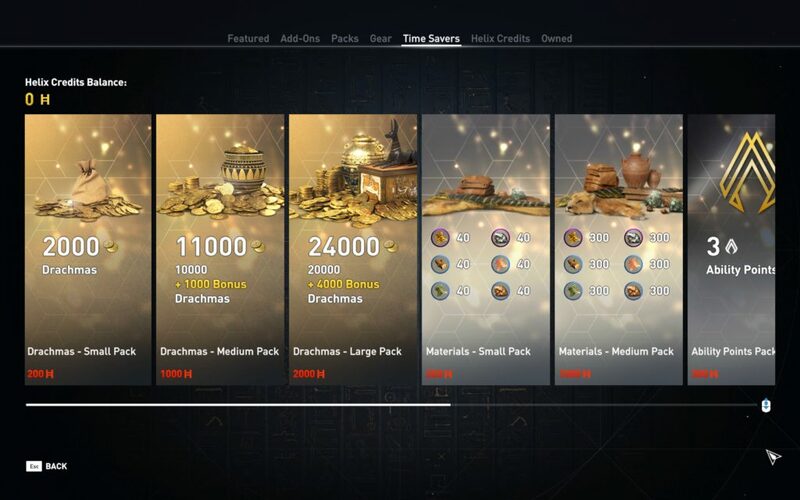 In Assassin’s Creed Origins these loot boxes are available for purchase with in-game currency (although said currency can be bought with real money as well) and are more akin to those present in Horizon: Zero Dawn. Far from containing pay-to-win items they simply offer small boosts of resources or equipment for the sake of convenience. There are other items that can be directly purchased but, other than the inclusion of some questionably powerful weapons and skill points, they are purely cosmetic and have no impact on gameplay whatsoever. So there’s nothing to fear here, this isn’t the cynical corporate cash-grab you’re looking for. Thank Ra for that. If Ubisoft had changed nothing about Assassin’s Creed during its two-year hiatus then chances are the writing would be on the wall for the franchise, carved into the very stones that its disappointed fans would have buried it beneath. But they did and here we are with a fresh start not just for fans but for the developers as well. Taking that little bit of extra time to polish and refine the game has made this a must play title that will keep you occupied for upwards of forty hours with the base content alone and thanks to the post-launch content that’s planned I have no doubt that like the pharaohs of old, Assassin’s Creed Origins will be remembered for many gaming generations to come.